There are few grills where one does not find at least a couple negatives. This however might be one. The reviews on Amazon of the SABER SS 500 Premium Stainless Steel 3 Burner Gas Grill are spectacular. It appears to be made in “grill heaven,” a 3 burner wonder that ignites with a simple button-push and has what are called “peaks and valleys,” patented grates that do away with flare-ups and allow for the meat’s natural juices to stay juicy and not dry up. For its size, 500 square inches of cooking space is remarkable, as is the other 175 square inches housing the warming rack. The stainless-steel is made of the highest grade which rounds out a great offer from Saber. For those BBQers who have a large family or you simply want more cooking area, then check out the Napoleon Prestige 500 NG Grill, which has 6 burners, output of 80,000 BTU’s in total. The primary cooking space is 500 square inches! Very rarely do folks get jazzed about gauges and buttons. But this is one of those times! The SABER 500 Premium Stainless Steel Gas Grill has some of the most easy-to-read gauges you will find on a grill today. Remember those gauges that you thought you needed an algebra lesson to decipher? Saber did away with the nonsense and these gauges make grilling easy and fun again. The ignition button is another winner here, igniting all burners simultaneously to ensure for even and consistent cooking throughout. The SABER 500 Premium Stainless Steel Gas Grill has incorporated something in the grilling world that is a constant source of pain when not available – the warming rack. Some warming racks are simply pieces of steel jammed into the top of the grill. Jammed without a purpose, we like to say. This Saber rack however rotates in and out, thus allowing the grill-master to use it when necessary, and then collapse it when not in use to take advantage of a wider cooking space. It weighs roughly 218 pounds, one of the lighter grills in this category. Convertible from propane to gas, and vice-versa via Saber patented technology. Infrared cooking system with easy to read gauges. Efficient fuel use, utilizing 30 – 50 percent less gas than similar models. Dual control burner capable of boiling water on the side. 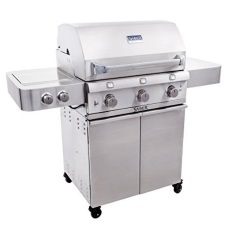 As we mentioned earlier, rave reviews for the SABER SS 500 Premium Stainless Steel 3 Burner Gas Grill. At the time of this writing, there are 10 customer reviews on Amazon sharing their thoughts on the grill as well. Those who have bought and used the grill give it a 4.5 out of 5 stars with 90% of votes being a 5-Star. In summary, the SABER SS 500 Premium Gas Grill is a winner in every conceivable category (except uneven cooking). We can’t imagine you unsatisfied with this purchase. Yes, it is over $1,000, but there are probably few grills that match up in the same price point. A solid buy, through and through.